Baltimore Orioles are always a welcome sight in the spring. You know the warm weather is sure to follow their migration north to mid-Michigan each spring. They are a bright, bold, black and orange bird with a big personality. But they aren't the only oriole in Michigan. Last year I was so happy to host an Orchard Oriole all summer. Orchard Oriole males are slightly smaller and usually have dark orange or brick red bodies and a black hood, back and wings. However, I saw second year male that was similar in appearance to the bright yellow bellied and brownish winged adult females, but had a solid black bib and black between the eye and bill. This skinny little guy was a little shyer than the Baltimore but such a treat to watch outside my window on the oriole feeder. New World orioles are a group of birds in the genus Icterus of the blackbird family. 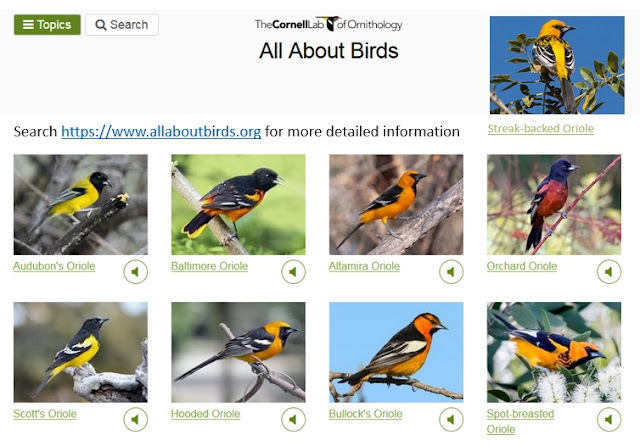 There are 33 oriole species in the Americas but only 9 in North America. The Baltimore Oriole and the Orchard Oriole are the 2 species that nest in Michigan as well as the Eastern half of the U.S. The Bullock's Oriole and the Scott's Oriole are found in the Western Regions. 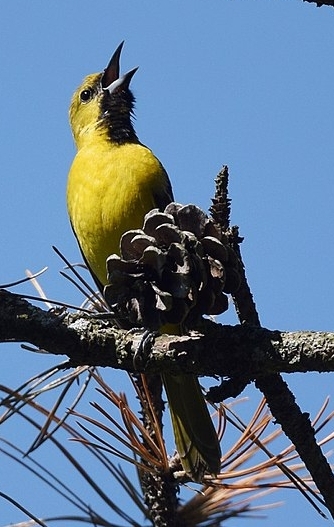 The Spot-breasted Oriole is found in Central Florida. And the Altamira Oriole, Audubon's Oriole, Hooded Oriole and the Streak-backed Oriole are mainly found in Mexico and some southwestern states. Our orioles are unrelated to Old World orioles of the family Oriolidae, even though they have a similar in size, diet, behavior, and striking coloration.